I cannot be happier to announce that OX has a brand new book chronicling some 30 years of his outdoor advertising billboard takeover work. I would wax on about OX's work in this post but instead I will just leave you with the forward I wrote for him that I think sums up my feelings about his process nicely. Advertising has developed a sophisticated language in its long history of helping products and ideas gain prominence in our local, and subsequently global cultures. The pragmatic use of words and descriptions gave way to the abstract use of color and suggestion to carry out its goal of persuasion. This fact is probably nothing new to the 21st century citizen as we inhale deeply the messages of corporate pioneers. What effects these persuasions might have on our societies is a hotly debated topic and one better left to the scholars of our times, the social scientists and the cultural anthropologists who are tasked with understanding how commercial media affects our behavior. Any citizen of a modern metropolis can attest to the rapid proliferation of outdoor advertising media on our streets, the billboard literally above all others in the hierarchy of outdoor commercial media venues. It is from this lofty perch that commercial media enters our consciousness and proceeds to act on our minds. While the goal of advertising campaigns in general, and of each individual campaign for that matter, might be various, each shares the need for your attention. All advertisement is first an appeal for your focus, a distraction from your current state of mind. To what ends this distraction is aimed can be debated, but that it exists, cannot. For many years OX has elegantly revealed this distraction by repurposing billboards for his own use. 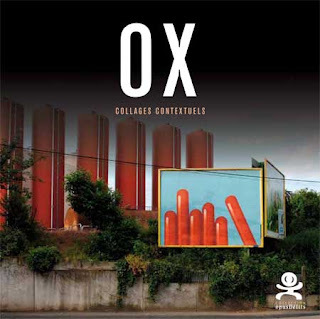 With incredible site specificity and consideration of the environment, OX’s judicious use of design focuses our attention not on the billboard itself, but back onto the environment in which it exists, drawing careful relationships between architecture, color, and space. In doing so, the billboard ceases to be a venue from which commercial media removes us from our environment by focusing our attention elsewhere. What once distracted us from the world around us is an opportunity for OX to bring us closer to one another by bringing our attention back to the present.